Why do birds suddenly appear . . . . . Following on from last week's column for braised lamb shanks, as promised, here is the recipe for spaetzle (which means little or baby sparrows). They are in fact a German wet noodle, that are made from a wet paste / batter. They are a particular favourite of mine, a dish I learnt all about when an apprentice (or lehrling as they call it in Germany). They are a speciality of the southern areas of Germany, where they are often served not just as a 'bilage' (accompaniment) to dishes but as a dish unto themselves - try . . .
Once you mind is opened and your imagination kick-started there is no end to the possibilities. Be adventurous: add some chilli, use a touch of green ginger, a sprinkling of fresh herbs and spices, open up your cupboard and / or fridge and think "now what have I got here that will go well together?" From start to finish, from collecting the ingredients to serving it up, you can make fresh spaetzlé in under ten minutes! Do you like pasta but you don't like spending hours trying to make pasta? Do you not have the money to spend on a pasta rolling machine? Then spaetzlé is for you. Traditionally spaetzlé is made by placing the batter on a board and with the use of a palette knife, scraped into noodles directly into salted, boiling water. But a quicker way is to pushed it through a press - the same type of press that you may have for mashing your potatoes? If you don't know what I mean, it is just a larger version of a garlic press. If you are looking to buy one, look for one with the largest of holes possible. From the same paste a dish called knopfle can also be made. 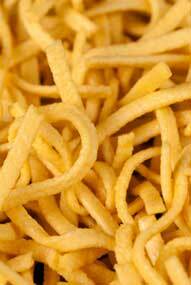 Which is done by pushing the paste through the holes of a colander; resulting in small round noodle lumps. Add water while working with a wooden spoon until a thick, wet, elastic batter is achieved. This should be a thick a batter as one can get before it becomes a dough. Other ingredients that may be added to this basic mix: chopped parsley, chopped herbs, cheese, spinach purée, garlic, tomato paste. Enjoy your Spaetzle and bon appetit . . . . .